BIOS : 2 X 32Kb - Phoenix 3.10.115. To access, Ctrl+Alt+S. RAM : Standard on motherboard : 1MB. Maximum on motherboard : 4MB (Use 256Kb/1MB SIMMs 9-bit 100ns). Speaker : Piezoelectric soldered on mothboard. 2. * Indicates default settings. 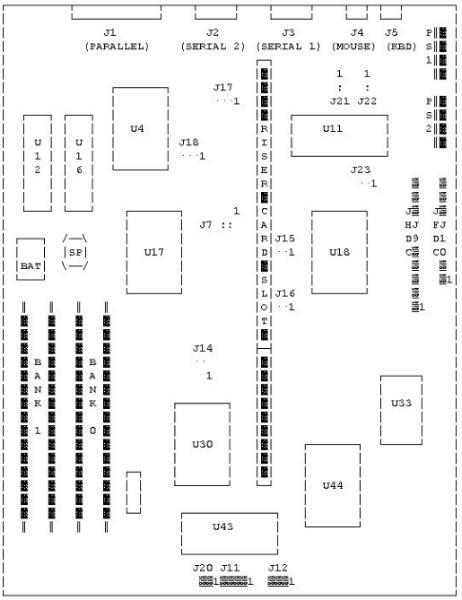 Maths Co-Processor : An 80287-8 co-processor can be installed, no jumpers need to be changed. Video Memory : This system is NOT VESA compatible. This system has 256k video memory soldered (not upgradeable).